The holidays can be hard – you’ve got relatives visiting from out of town, you have to find a present for Secret Santa, and you have no clue how to cook a turkey. With so many things on your plate, it can feel like your to-do list keeps growing and then the anxiety starts to creep in… I get it; I’ve been there! The one thing I truly love about the holidays is when everyone sits down around a table and breathes a collective sigh of contentment – but wait… did you remember to set the table? A table setting can be as elaborate or as simple as you like. If you want to go all Martha Stewart, you go for it! (Send some of that energy my way!) 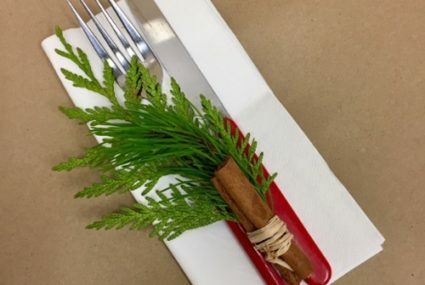 For those of us who are pressed for time, but still want to impress, here are five easy ways to add some flare to your table without going overboard. I’m sure we all have at least one or two kicking around our storage rooms looking a little dusty and sad. Dust those babies off, and use some fresh winter greens to create a simple bouquet. 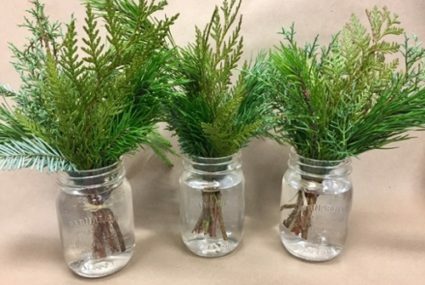 Cedar, pine, and fir are my favourites and are easily accessible. Want to go a step further? The day of your event, add fresh cranberries to the water for some extra colour. Tie a ribbon around the mouth of your jars to finish the look. Greenery garlands are super popular right now – we’re seeing them used in weddings as an alternative to table runners or centrepieces. 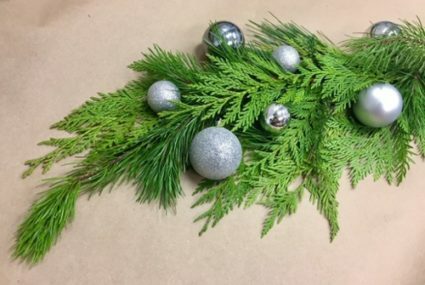 To make your “garland”, simply layer fresh winter greens on your table, covering the exposed brown ends with pinecones and smaller pieces of greenery. Add in some Christmas ornaments or candles throughout for a more elegant look. I’d recommend using cedar, as it’s the flattest winter green. Magnolia leaves add an unexpected texture with their velvety brown backs. 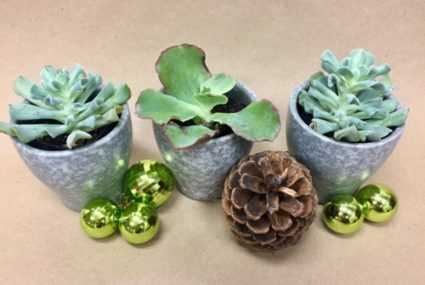 Succulents are an unusual and minimalistic approach to decorating your table. I’ve planted these little guys in neutral pots that will blend nicely with the rest of the table. Adding a little bit of winter greenery or some small pinecones will give the plants a festive feel without being too glitzy. That being said, adding a little bit of glitter spray will liven them up if you are one for some sparkle! The plants can also be given away as gifts at the end of your evening! If you’re not a fan of wintergreens or don’t want to deal with plants, eucalyptus is a tried and true favourite. 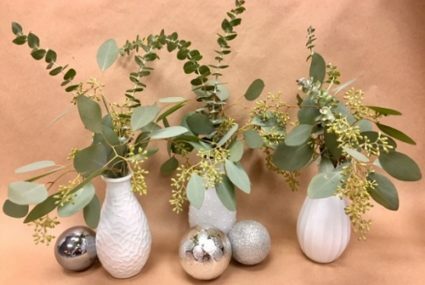 Clustered stems of eucalyptus add a softness to your table, and the scent is known to reduce stress and is a natural deodorizer (if you’re worried about burning your turkey, this one’s for you)! Baby eucalyptus adds height, while seeded and silver dollar eucalyptus create a cascading effect. Find some vessels (they don’t have to match), and fill ‘em up! If you’re expecting a lot of company and don’t have much room for extra accessories, a small cluster of wintergreens laid on each guests’ plate or napkin will bring your table setting together. Add a cinnamon stick or a little bow for some variation. A candy cane is perfect if you’re hosting guests with children (or let’s face it, even if it’s all adults, who doesn’t like a sweet treat?). I hope these ideas let you check one more thing off your list, and let you sit back and relax this holiday. My love of flowers and plants stem from the pure joy they bring to everyone’s lives. Merry Christmas and all the best for 2018!